The latest GPU-Z 0.5.8 includes a new feature that displays the quality of the GPU (ASIC quality) of recent graphics cards (GeForce GTX 400, GTX 500 and Radeon HD 7800, HD 7900 series). Not all GPUs on a silicon wafer have the same quality, some dies are finer than other. 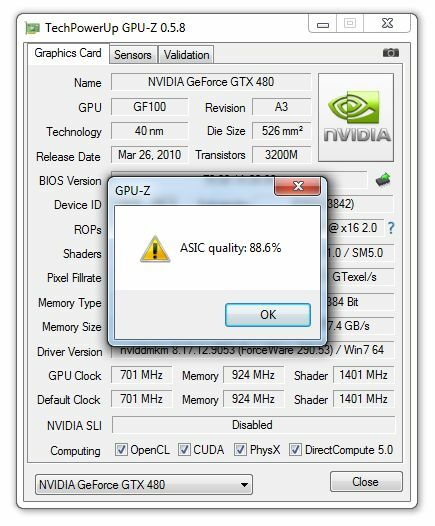 The finest dies are reserved for ultra-high end cards (like MSI’s Lightning series, ASUS Matrix, EVGA Classified for example) while pieces of silicon with large amount of electrical leaks are found in entry level cards… The ASIC quality should allow to quickly know if a GPU is overclockable or not. 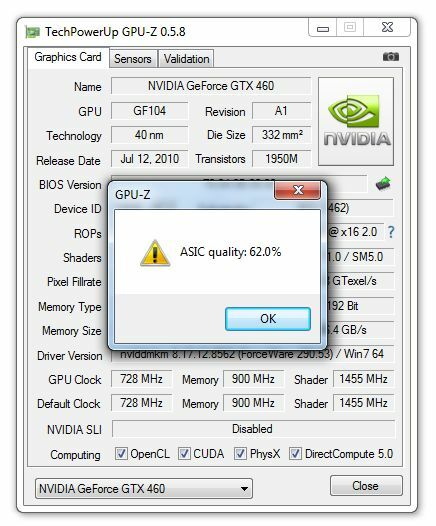 As you can see with MSI’s GTX 460 Cyclone samples, you can’t rely too much on ASIC quality to choose a graphics card because even on the same model of graphics card (here MSI GeForce GTX 460 Cyclone 768D5 OC), ASIC quality values can be quite different. As I said, finest GPUs are found in high-end graphics card (MSI’s Lightning: > 96%) while worst ones are found in entry level card (ASUS GT 520: 56%). 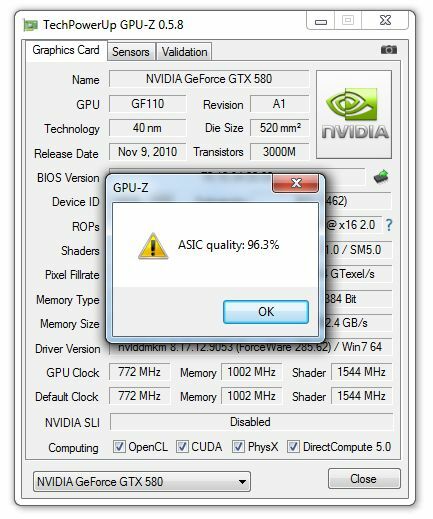 This test with two identical cards (MSI Cyclone) is interesting because it shows us that ASIC quality detection is not based on a database. Then the question: how ASIC quality detection is done and, above all, is it reliable? 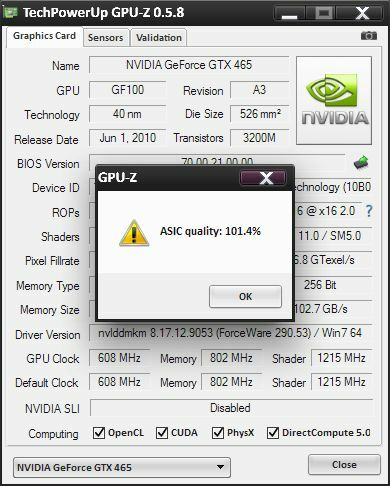 And you, what is the ASIC quality of your GPU? Actually, it does the opposite! We scale the voltage based on leakage, so the higher leakage parts use lower voltage and the lower leakage parts use a higher voltage – what this is does narrow the entire TDP range of the product. Everything is qualified at worst case anyway; all the TDP calcs and the fan settings are completed on the wors case for the product range. MSI GeForce N260GTX Lightning 1792MB is Hot and Loud! 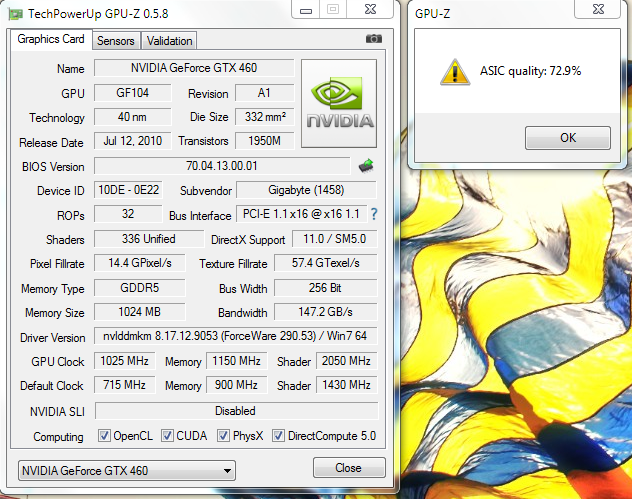 Thanks for this gem of GPU! 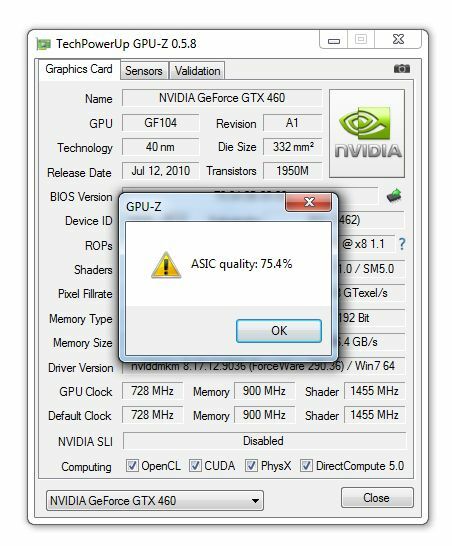 JeGX, do you think a GPU would have a better ASIC quality being the first made or late in it’s life. For example if you had gotten your 460 the day it came versus 6 months after it came out. Where is the intelligence of fussing and congratulatory back-slapping over numbers coming from a test the validity of which you have no idea, and neither do you have any idea of the methodology of the test, or even what’s being tested. Up pops a number and you have GpuGasms over it!! Look at it this way, let’s say there’s an imperfect car manufacturing company, and not all the cars that come out of it have perfectly aligned and balanced wheels, and so to “increase yields”, the car maker puts its cars (at the factory), through corrective studs that will align/balance out wheels. 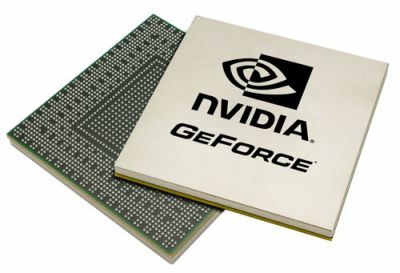 Not all GPUs are born equal, not even in the same wafer. Some have higher electrical leakage, some have low. So to correct them in the fab, their degree of leakage are measured and corrective fuses are added to the GPU package, and correct VID set for the chip’s leakage characteristics. Later, NVIDIA/AMD segregate “good” chips from “normal” based on leakage/VID, the “good” ones are put into higher bins, the “normal” ones go to reference / low-factory-OC cards, the “good” ones go to high-factory-OC cards. 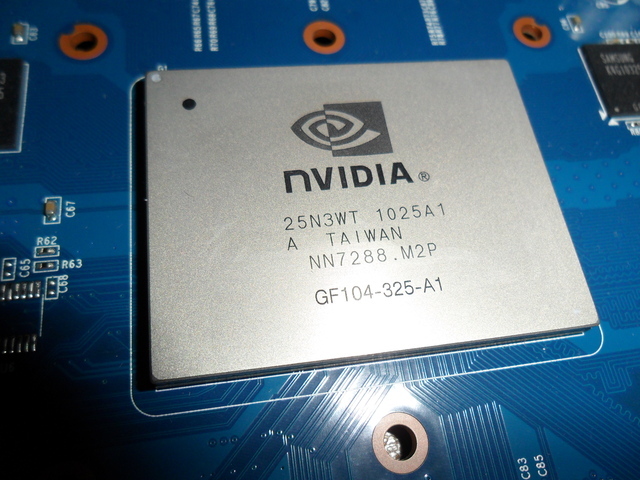 Multiple SKUs based on the same physical GPU are also carved out this way. “normal” ones go to lower SKUs, “good” ones go to higher SKUs. I don’t understand where this “asic quality” came from but it seems really bogus. 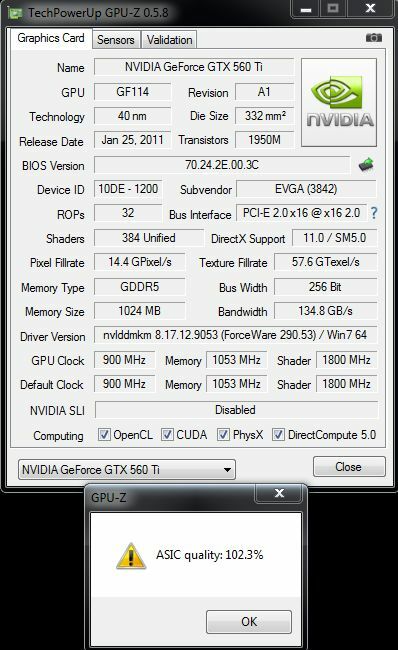 With my EVGA GTX 580 (model 1580, reference) (I have 2 of them in SLI) I get 84% but both cards overclock wonderfully and much higher than other prople having 85 or 90%. 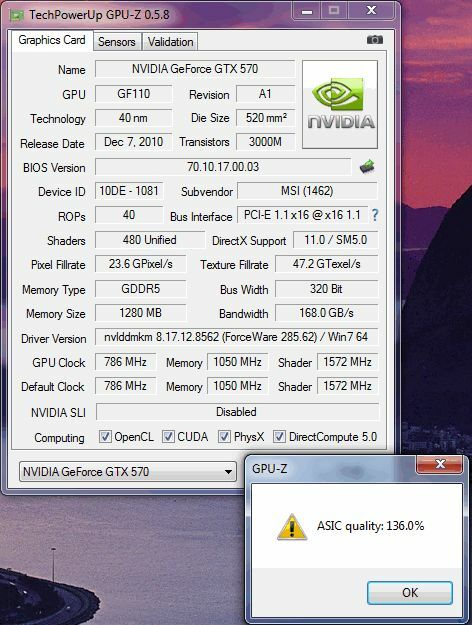 On another PC I have 2 PALIT GTX 460… the first one says 90.6% the second one says 67.7. How can I know ASIC Quality? i think the measure of “quality” represents the “uniformity” of the device idle state leakage threshold, i.e. how much is the divergence between between the leaky and normal (less leaky) transistors. It is known that there is a variance within an IC device, and if the difference between the leakage of all the transistors is large enough, the Vcc of the whole device must be binned to a higher level, to maintain operational status. The only puzzlement here are the values above 100%. The ASIC quality is based on the default voltage fused into the chip after testing at the factory. @Leith Bade, no it is not.. High leakage chips requires lesser voltage to operate at nominal clocks than low leakage chips.. if you want more information check AMD technical marketing manager Dave Baumann’s comments about binning their chips..
@MFA – you got it all wrong. Chip is based of transistors. In ideal state there should be only switching losses however due to leakage we get additional losses – higher leakage higher losses (and heat) And since losses are proportional to freq*voltage^2 it’s quite obvious low leakage chips withstands higher voltage AND/OR frequency while high leakage chips uses lower voltages and can’t reach frequencies of low leakage chips. Do you not response the my post previous important yet?? Wow this is the biggest bogus I’ve read for years. First they do not explain at all how they determine the ASIC quality this should give you some major hint on how bogus this number is. 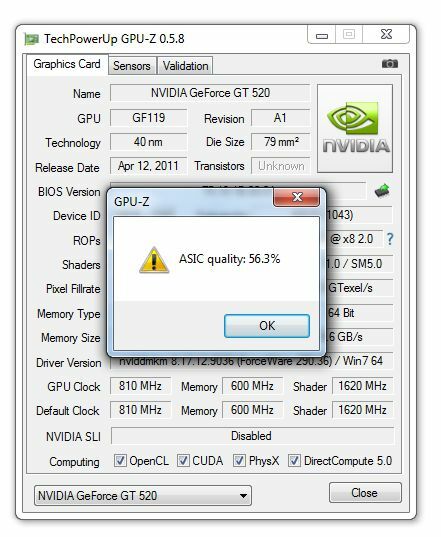 Wow my GTX 470 is a piece of trash. I got only 53.4%.